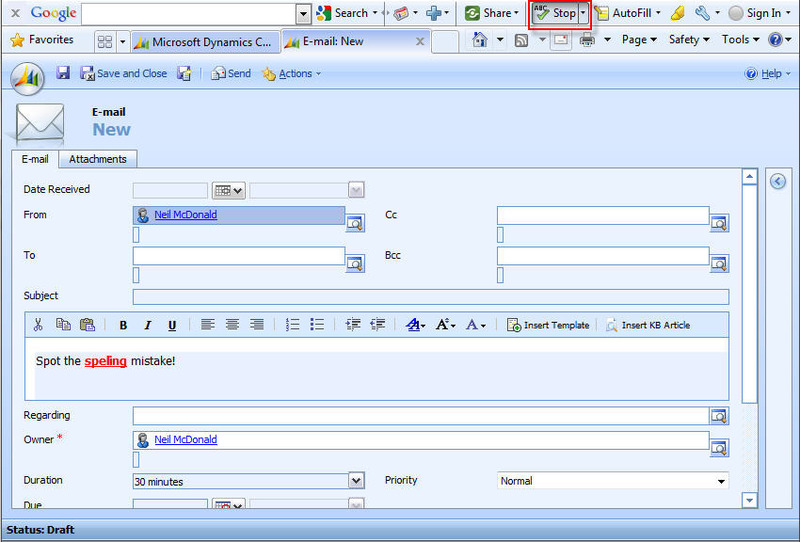 Dynamics CRM 4 does not come with the ability to compose HTML emails. This limits what can be done via marketing campaigns and email templates. There are companies who have created various addons and accelerators for this. Most give marketing stats and pretty graphs, but they are very expensive and do more than you need in many cases. If you are looking to just send out a HTML email and do not care about click through rates etc then this free option should help. You’ll need a HTML editor and a web site where you can host a web page and some images. 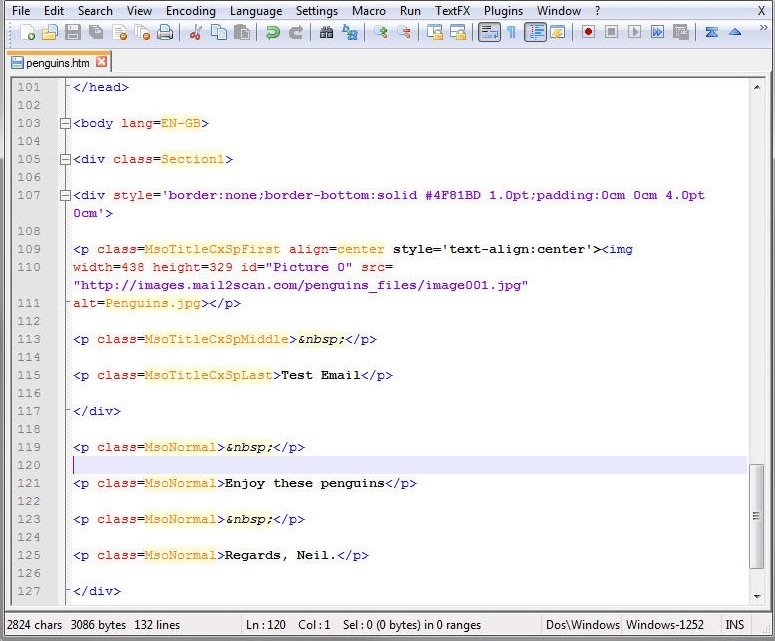 First of all, you need to create your HTML email in you HTML editor. 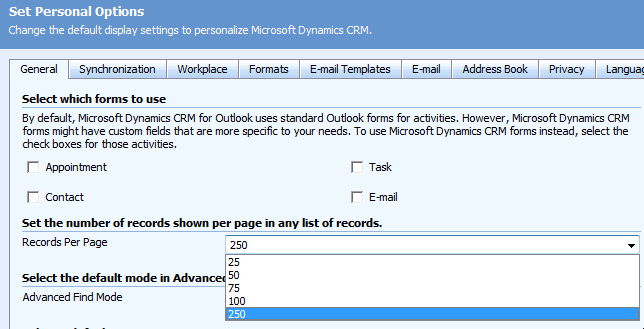 Dynamics CRM 4 only allows users to view a maximum of 250 records per page within a view. This can be quite limiting when you need to run an on demand workflow against thousands of records. There are 2 ways to get around this limit. The Microsoft supported solution is to use a plugin as described here. The unsupported and more risky workaround (and what I did…) is to update the organisation database directly as below. If using the SQL method, I recommend that you change it back to 250 rows or less once you’ve accomplished your tasks, as this is not supported by Microsoft and could cause errors with future updates. I had a requirement to set an ‘Age’ attribute based on the contents of the Date of Birth field on Contacts. The below script in the On Save, On Load or On Change will do this. Note: You will need to change the “birthdate” and “new_age” field names to the relavant fields on your form. var diff = now.getMonth() - birthday.getMonth();  //have they had their birthday already this year? Microsoft have released the hour long Worldwide Partner Conference 2010 session on Dynamics CRM 5 (now officially called Dynamics CRM 2011). You can watch the video here.?? They also announced the Dynamics Marketplace,? ?which is a place for partners to share applications and extensions with the rest of the Dynamics community. 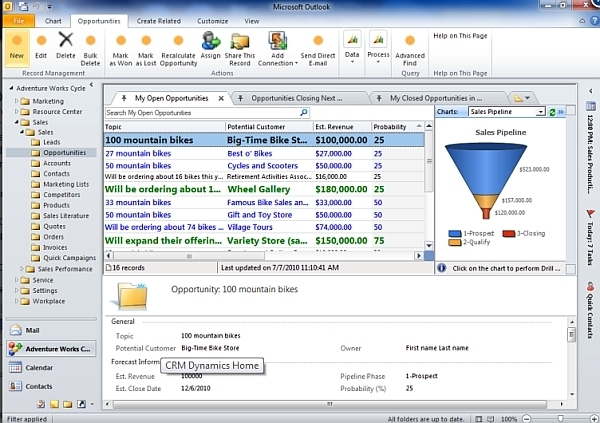 Both the Dynamics Marketplace and CRM 2011 beta should be available in September 2010.